AP Students to learn 22 languages in 22 days with Videos - AP Ek Bharat Shreshtha Bharat Guidelines : 22 రోజుల్లో 22 భాషలు - ఆంధ్రప్రదేశ్ స్కూళ్లలో భాషా సంగమం AP Bharat Shreshtha Bharat 2018 Guidelines, Activities, Day Wise Schedule : Bhasha Sangam Programme Activities, Guidelines for AP and TS Schools and Celebrating the Linguistic Diversity of India: Guidelines of Ek Bharat Shreshtha Bharat 2018 Step-by-Step Guide for users to access e-resources linked to QR code, Date/day wise schedule op the languages to be covered in a month 20th November to 21st December, 2018 Objectives and Features, Suggested Activities, Suggestions for the Educational Administrators and Contact Us. All the District Project Officers of SSA, District Educational Officers and Principal of DIETS in the State are informed that, the Government of India has decided to conduct of "Ek Bharat Shrestha Bharat - Bhasha Sangam" in India for celebrating the Linguistic Diversity of India from 20-ll-2018 to 2l-12-2018 in various languages. ఆంధ్రప్రదేశ్ రాష్ట్ర వ్యాప్తంగా ఉన్న అన్ని స్కూళ్లలో భాషా సంగమం కార్యక్రమం చేపడుతున్నారు. కేంద్ర మానవ వనరుల శాఖ ఆధ్వర్యంలో నిర్వహిస్తున్న ఏక్ భారత్, శ్రేష్ఠ భారత్ ప్రచారం కింద ఈ కార్యక్రమం ప్రారంభించారు. దేశంలోని భాషా భిన్నత్వాన్ని సెలబ్రేట్ చేసుకోవడంలో భాగంగా ఈ ప్రచారం మొదలుపెట్టారు. ఇందులో అస్సామీస్, బెంగాలీ, బోడో, డోగ్రి, గుజరాతీ, కన్నడ, కశ్మీరీ, కొంకణీ, మైథిలి, మరాఠీ, సంథాలీ, ఉర్దూలతోపాటు పలు ఇతర భాషలు ఉన్నాయి. 22 రోజుల్లో ఏ రోజు ఏ భాష నేర్పించాలో చెబుతూ ముద్రించిన పుస్తకాలను రాష్ర్టాలకు పంపిణీ చేస్తున్నారు. ఇందులో భాగంగా అన్ని ఆంధ్రప్రదేశ్ లోనూ అన్ని స్కూళ్లలో విద్యార్థులకు 22 రోజుల్లో 22 భాషలు నేర్పించనున్నారు. 1. This will be run by the State/UT Department of School Education. 2. A short dialogue consisting of five simple, commonly used sentences has been designed in 22 languages for use by students of all classes. These sentences are at pages 1 to 22 of this booklet and have been arranged in alphabetical order of the language. It may be noted that the translations in Roman and Devanagari scripts have been simplified for use by children. 3. Sentences from each language are to be shared with students everyday for 22 working days. Everyday only one language will be shared. A schedule in this regard giving the language of the day is placed at page ii of this booklet. 4. 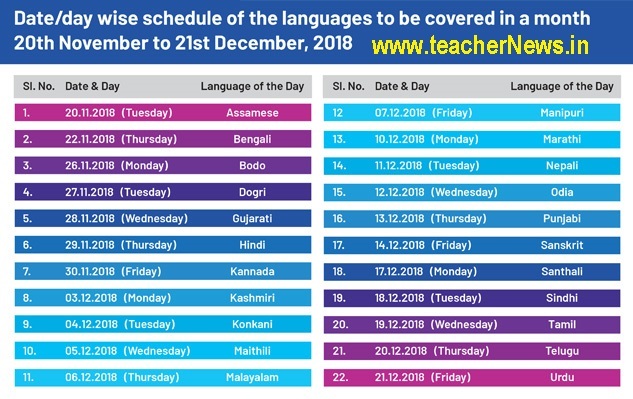 In case any school misses a language on any day, then it should continue with the schedule as at page ii and cover the missing language at the end. 5. A digital book with audio recordings of the dialogues is available on the websites http://epathshala.gov.in/ and MHRD website http://mhrd.gov.in/bhashasangam so that students can hear the correct pronunciations. 6. The suggested activities should be carried out in a joyful and interesting manner. Students have enjoyed the activities and participated with great enthusiasm wherever this initiative has been piloted. This initiative is not mandatory and there should be no formal testing of any kind. 7. Heads of schools may upload photographs and videos of daily activities under Bhasha Sangam. The State/UT Department of School Education and the DEOs and BEOs may also upload/submit photos and videos of the activities at the State/UT level, and the district and the block level respectively. The Department of School Education and Literacy, MHRD, Govt. of India will recognise and award the best schools, the best blocks, the best districts and the best States/UTs on the basis of the uploaded/submitted photographs and videos. 1. The 5 sentences pertaining to the language of the day should be read out e.g. Assamese on day 1, Bengali on day 2 etc., in the morning assembly, and students asked to repeat them. In case there is any student from that State, e.g. Assam on day 1, West Bengal on day 2 etc. or who speaks the language studying in the school, then he/she or even all of them should preferably read out the sentences in the morning assembly. Similarly, any teacher, parent, government servant or any other person from that State or who speaks the language, may be invited to read out the sentences. 2. Senior students may be encouraged to create posters on these sentences, these can be put up all over the school. 3. Teachers may address the students and converse with them in the language of the day, and encourage students to do the same. 4. Students may be encouraged to share these sentences with their families at home. 5. The schools may carry out other activities related to this initiative. Bhasha Sangam Programme Activities, Guidelines for AP and TS Schools and Celebrating the Linguistic Diversity of India. Guidelines of Ek Bharat Shreshtha Bharat 2018.